Following the latest round of regional elections in Spain on Sunday, the foreign media clearly seem to have focused their attention on the victory of Spanish Prime Minister Mariano Rajoy's Partido Popular (PP) in Galicia (see, among others, this article from today's FT). 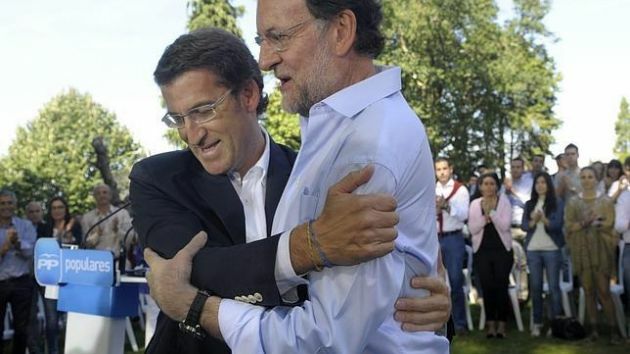 Of course, the fact that outgoing Galician President and PP candidate Alberto Núñez Feijóo (pictured with Rajoy) has not only confirmed his absolute majority, but also managed to consolidate it by winning three more seats than he had during his previous term is remarkable, given the nationwide drop in the party's popularity. However, the significance of the victory in Galicia should not be exaggerated, for a number of reasons. Firstly, Rajoy is Galician. Although, as noted by the Spanish press, he avoided appearing next to Feijóo during most of the electoral campaign, Rajoy did travel quite a lot across the region - and it would be naïve to think that his personal involvement did not win Feijóo a few extra votes. Secondly, Galicia is a region with solid right-wing credentials. The region has been governed by centre-right forces for much of the time since Spain returned to democracy - including fifteen consecutive years between 1990 and 2005 under Manuel Fraga Iribarne, a former minister under Francisco Franco (a Galician native himself) and the founder of Alianza Popular in 1976, which became Partido Popular in 1989. Therefore, we definitely think the results of the Basque elections were far more interesting - for one very simple reason. Unlike after the previous elections in 2009, Rajoy's Partido Popular and the opposition Socialist party together do not command a sufficient majority to stop the candidate of the Basque Nationalist Party (PNV) Íñigo Urkullu becoming the region's new President - although he will need the support of other parties to secure a majority in the Basque parliament. It is not unusual for nationalist parties to be in government in the Basque Country, but the context looks quite different this time. During the electoral campaign, Urkullu has clearly said that he wants to make the Basque Country a "European nation". The expression must sound worryingly familiar to Rajoy and his cabinet, as it clearly echoes Catalan President Artur Mas's recent calls for Catalonia to become "a normal nation within Europe". Incidentally, a new Feedback poll for Catalan TV channel RAC1 this morning credited Mas’s party with 67 seats in the 25 November regional elections – only one seat short of an absolute majority in the Catalan parliament. The same poll also found that over 70% of Catalans are in favour of pushing ahead with plans for a referendum on the relationship between Spain and Catalonia, even if the Spanish government prohibits it. The Catalan elections are yet to take place, but there is clearly the potential for a major 'sovereigntist' headache here - and at a time when the Spanish government can least afford it. The same as with so called populist parties the trend has clearly changed. Before a lot of people didnot vote for these new/unknown and often a 'bit wild' parties because they went for 'sure' at the end. But with main stream parties making a complete mess of it that 'sure' element looks to have gone. Combined with the fact that traditional political parties are seem as simply untrustworthy by most voters now, this gives a huge potential for new or traditionally not main stream parties. If you have to take risks anyway why not give the guys that didnot make this mess a chance. That is imho also the reason why if the Catalan leadership play their cards right they will get what they want. They can simply offer roughly 10% (of GDP) less tax or more services without the drag of the mainland. Combine this with Spanish leadership which make Rompie look charismatic and complete the wrong response from that side as well and you have an explosive mix. Basques probably better see what happens in Catalunya and react on that. All seems to be playing rather short term anyway. And if one region goes somewhere we likely see a lot of momentum also in other countries. Except in Scotland very likely, the only region where the PR is properly managed by the central government. One of the most important issues is giving people the idea that they are important and their opinion counts (something we havenot seen in Spain). The want as much to be able to go if they want that as they want really to go. Why does it matter? They will be ruled from Brussels as soon as they take the 'bail-out' which they will have to if they want to stay in the euro. And the bail out will not work: you have to mend the hull before trying to spoon out the water.